Note: The above co-ordinates are for parking and not the cache itself. The theatre building was originally Saint James’ church, the nave of which was constructed in 1848 and the chancel re-constructed in 1900. In 1983 the church was declared redundant by the Church of England, as part of a larger countrywide rationalisation. The very last Evensong was held on February 20th of that year. 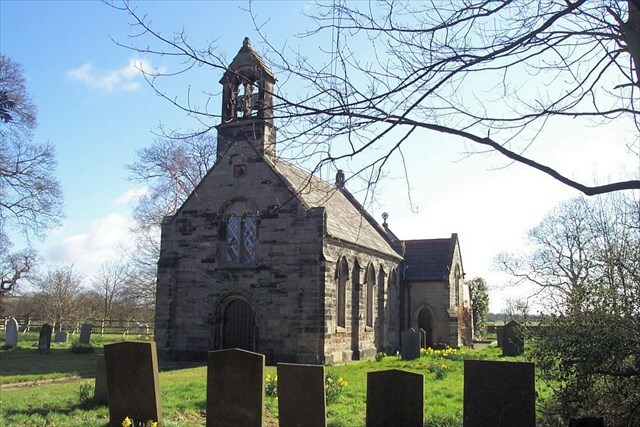 The right hand bell is the oldest church bell in Staffordshire, dating from the 12th century. Bells of this time were longer and narrower than their more modern equivalents. I have enjoyed a number of caches in this series in other parts of the country and there are still relatively few in Staffordshire. Hopefully the caches that we place will encourage other Staffordshire-based CO's to contribute to the world's largest series. If anybody would like to expand to this series please do, I would just ask that you could let Sadexploration know first so he can keep track of the Church numbers and names to avoid duplication. The cache is not in the theatre grounds. The gates were given in memory of John Reginald Thomas who lived from 18AB to 19CD and his son, John, who lived from 19EF to 19GH.